Paul went to Jerusalem. There some Jews accused him of teaching against Jewish law and of defiling the temple by bringing Gentiles into it. The whole city was in an uproar, and people came running to see what was happening. 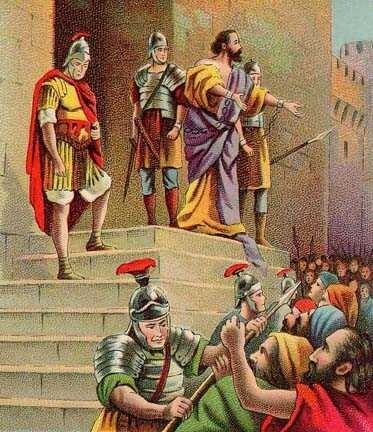 They were trying to kill Paul, but he was rescued by the Roman soldiers. The crowd was so violent they had to carry Paul to get him away from his enemies. They stopped on the stairs to the castle and Paul asked to speak to the crowd. With soldiers around him, he began to defend himself. He told of his conversion. They listened for awhile until he said the Lord had sent him to the Gentiles. Then they became violently angry. The commander took him inside and ordered him to be beaten. They didn't know Paul was a Roman citizen, and Roman citizens were not to be beaten. When he told them of his citizenship, they became fearful of how they had treated him. The commander ordered him to appear before the Jewish Sanhedrin. He caused a division between the Pharisees and the Sadducees by revealing he was a Pharisee and believed in the resurrection of the dead. There was another uproar, and the commander took him to the barracks. That night the Lord stood near Paul and told him to take courage. He was going to Rome to tell the people there about his faith. There was a plot to kill Paul, but his nephew learned of it and told the authorities. The commander decided to send him to Governor Felix. To insure his safe arrival, he was accompanied by 200 soldiers, 70 horsemen, and 200 spearmen. They left at 9:00 at night with Paul riding on horseback. The civil authorities came to Paul's rescue when he needed help, and delivered him from the crowd. You are fortunate if you live in a country where you are protected by the government officials. This is part of the job of government; to protect its citizens. We must obey the laws of the land if we want to enjoy this protection. If you disobey the laws, then you have to fear what the authorities may do to you. God says, "Do not steal". The laws of the land say, "Do not steal". If you are a shoplifter, then you have a reason to fear the authorities because now their job is to prosecute you for your wrongdoing. Live your life in such a way that you do not have to fear the policeman. English Bible Activities Select stories #265-266 in the list for activities to accompany this Bible story. Spanish Bible Activities Select stories #265-266 in the list for activities to accompany this Bible story. Press "Go" to search for Apostle Paul DVD. This page displayed 50,776 times.